If you needed proof that the quest for “unique” children’s parties has gotten a little out of hand, then this unfortunate series of events will seal the deal. Painted pony parties are apparently a thing, and we can’t help but think that Instagram might be fuelling this unnecessary nonsense. Lots of people are furious about this new party trend. 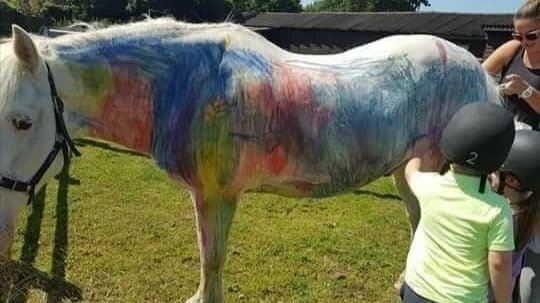 A petition has been created online, in an effort to ban these painted pony (apparently UK) parties which involve small children scribbling and drawing on ponies with chalk. Elisa Allen, UK Director of PETA (People for the Ethical Treatment of Animals) says painted pony parties are “wrong” and that animals are not colouring books. The petition, created by someone known as ‘concerned citizen’ urges people to track down businesses that are promoting and carrying out pony painting, and let them know it’s simply unacceptable. But not everybody thinks pony painting is “insensitive”. Some say that the ponies quite enjoy the attention. “Pony is enjoying the attention, his head is low, eyes half closed and one back foot cocked up, totally relaxed, he doesn’t care and doesn’t know about exploitation or being objectified, he’s happy well fed and getting all the attention,” another wrote. But a pony party critic points out that it’s not purely an issue of happiness, but rather of respect.